The first decade of the twenty-first century has seen a sharp decline in respect for human rights and the international rule of law. The legal conventions of the new realpolitic seem to owe more to Guantanamo than Geneva. In WATCHING BRIEF, noted lawyer and human rights advocate Julian Burnside articulates a sensitive and intelligent defence of the rights of asylum seekers and refugees, and the importance of protecting human rights and maintaining the rule of law. Burnside also explains the foundations of many of the key tenets of civil society, and takes us on a fascinating tour of some of the world's most famous trials, where the outcome has often turned on prejudice, complacency, chance, or (more promisingly) the tenacity of supporters and the skill of advocates. Julian Burnside also looks at the impact of significant recent cases - including those involving David Hicks, Jack Thomas, and Van Nguyen - on contemporary Australian society. 9 February 2008: Julian Burnside speaks at the launch of Watching Brief - Launch of Julian Burnside's 'Watching Brief: reflections on human rights, law, and justice', at fortyfive downstairs, 45 Flinders Lane in Melbourne, on 15 Dec 2007. 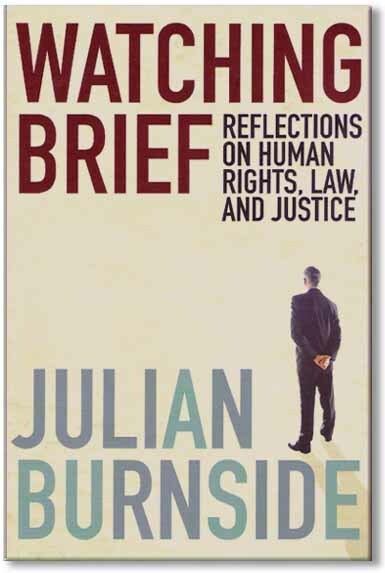 This is an edited extract from WATCHING BRIEF: reflections on human rights, law and justice, by Julian Burnside. NEXT month marks the second anniversary of Van Nguyen's death. The Government of Singapore killed him. In Australia, the public mood was overwhelmingly against his execution. The struggle for his life was brave and tenacious. We will not forget the heroic efforts of Lex Lasry, QC, and Julian McMahon. We will not forget the anguish and torment of his family and friends as the fight to save the convicted drug trafficker continued. Public sentiment against hanging Van Nguyen shows how far this community has matured since those days 40 years ago when Barry Jones led a similar struggle to prevent the state of Victoria from executing Ronald Ryan. But the Australian public apparently supported the idea of executing Saddam Hussein, and the Australian Prime Minister wants to see the Bali bombers executed. How can these different attitudes co-exist in the same community? There are some obvious differences: Van Nguyen hurt no one but himself; Saddam Hussein and the Bali bombers killed brutally and indiscriminately. But capital punishment is unjustified, no matter where, no matter what the crime, no matter who the criminal. One of the most famous arguments against capital punishment was made by Clarence Darrow in his plea in the 1924 murder trial of Leopold and Loeb. It was a case that had the whole of the US baying for blood. Nathan Leopold and Dickie Loeb were young, rich, brilliant and privileged. They came from the best families in Chicago. They decided to prove their intellectual superiority by committing the perfect crime. They kidnapped Bobby Franks. While Leopold drove the rented car through the streets of Chicago, Loeb sat in the back with Franks and killed him with a chisel. They drove out of Chicago looking for a place to dispose of the body. They stopped for a snack on the way. They stuffed the body into a culvert and headed home. Then they tried to extract a ransom payment from Franks' father. It was an appalling crime, which made headlines worldwide. Darrow, who normally acted for the underdog, was persuaded to take the case. He was passionately opposed to capital punishment. The state, the press, and the public were determined to see Leopold and Loeb hang. In his plea, Darrow marshalled the key arguments against capital punishment. First, capital punishment does not prevent or deter crime. That is the fact of it. It is not surprising: most murders are acts of impulse or passion. Most murders are not committed after calm reflection. Terrorists are unlikely to be deterred by the prospect of capital punishment - if they do not kill themselves in the course of their attack, they will likely be willing martyrs to the state. Capital punishment does not prevent crimes; countries that have abolished capital punishment have experienced no increase in the crime rate. "If a doctor were called on to treat typhoid fever, he would probably try to find out what kind of milk or water the patient drank, and perhaps clean out the well so that no one else could get typhoid from the same source. But if a lawyer was called on to treat a typhoid patient, he would give him 30 days in jail, and then he would think that nobody else would ever dare to take it. If the patient recovered in 15 days, he would be kept until his time was up; if the disease was worse at the end of 30 days, the patient would be released because his time was out." Second, he spoke of the idea of an eye for an eye. Those who turn to the Bible for justification must reach back to the Old Testament: an eye for an eye, a tooth for a tooth ... But as Mahatma Ghandi said: take an eye for an eye and soon we are all blind. Darrow said: "I could say something about the death penalty that, for some mysterious reason, the state wants in this case. Why do they want it? To vindicate the law? Oh, no. The law can be vindicated without killing anyone else. It might shock the fine sensibilities of the state's counsel that this boy was put into a culvert and left after he was dead, but, your Honour, I can think of a scene that makes this pale into insignificance. I can think ... of taking two boys, one 18 and the other 19, irresponsible, weak, diseased, penning them in a cell, checking off the days and the hours and the minutes, until they will be taken out and hanged ... I can picture them, wakened in the grey light of morning, furnished a suit of clothes by the state, led to the scaffold, their feet tied, black caps drawn over their heads, stood on a trap door, the hangman pressing a spring, so that it gives way under them; I can see them fall through space - and - stopped by the rope around their necks." In Iran, mobile cranes are used to hang prisoners. The corpses are left hanging for all the citizens to see. Will this improve them or diminish them? For some offences, capital punishment of women is inflicted by stoning. It is a truly dreadful way to die. The victim, fully bound from head to foot in white bandages, is buried waist deep in the earth. Immobilised this way, she is pelted with rocks the size of fists. Because she cannot see the rocks coming, she cannot duck in anticipation, but flinches in response to every hit. The bandages are soon flushed with blood and gradually the body sags and collapses. Any society that tolerates state executions is damaged by them. "Do I need to argue to your Honour that cruelty only breeds cruelty? That hatred only causes hatred; that if there is any way to soften this human heart, which is hard enough at its best, if there is any way to kill evil and hatred and all that goes with it, it is not through evil and hatred and cruelty; it is through charity, and love and understanding." Third, and most important: capital punishment is the cold-blooded killing of a person by the power of the state. Let us not flinch from this: after investigation, trial, and appeals, after all passion is spent, the state coldly, deliberately kills a human being. Albert Camus wrote brilliantly on this point in 1957: "An execution is not simply death. It is just as different from the privation of life as a concentration camp is from prison. It adds to death a rule, a public premeditation known to the future victim, an organisation which is itself a source of moral suffering more terrible than death. Capital punishment is the most premeditated of murders, to which no criminal's deed, however calculated, can be compared." Darrow addressed the state's argument that the killing of Bobby Franks had been cold-blooded, and turned it back on them: "Cold-blooded? Why? Because they planned, and schemed. Yes. But here are the officers of justice, so-called, with all the power of the state, with all the influence of the press, to fan this community into a frenzy of hate; with all of that, who for months have been planning and scheming, and contriving, and working to take these two boys' lives. "You may stand them up on the trap-door of the scaffold, and choke them to death, but that act will be infinitely more cold-blooded ... than any act that these boys have committed ... Cold-blooded! "Let the state, who is so anxious to take these boys' lives, set an example in consideration, kindheartedness and tenderness before they call my clients cold-blooded." Then there are those who turn to holy scriptures for guidance in these matters. To justify the execution of murderers, they turn to the sixth commandment: thou shall not kill. It is one of the most basic moral lessons and the most universal. Not surprising perhaps, given the individual self-interest we all have in it being a general rule. But capital punishment breaks this rule just as surely as murder does. Here, the proponents of capital punishment will object that there are exceptions to this rule; and there are: killing in a time of war, and killing in self-defence. To this, they will add that capital punishment is a form of self-defence: it is the way society defends itself against those who violate its most important rules. But even this argument for capital punishment breaks down. Killing in war and killing in self-defence both have limits. A soldier cannot deliberately kill civilians, or prisoners, because they are not a threat to the life of his country. Self-defence has to be a reasonably proportionate response to the attack. A person who kills an intruder in the course of warding off a deadly attack will successfully argue self-defence. It will be quite different if he overpowers his attacker, ties him up, and a few days later coldly strangles him to death. That is not self-defence; it is murder. So it is with capital punishment. A convicted criminal may need to be punished to set an example to the rest of society; he may need to be locked away to protect society from the risk he presents. Killing him in cold blood offers no more protection than locking him up; it is just a premeditated killing, animated by a base desire for vengeance. As a society, Australians seem to have accepted that capital punishment is calculated murder by the state; that the state should set an example in showing respect for the sanctity of life; that capital punishment exposes the darkest corner of our soul. If those are our principles, we should be consistent in them: capital punishment in Guantanamo, or Singapore, or Indonesia is as bad as capital punishment here; Saddam Hussein was a human life just as Van Nguyen was a human life. Respect for human life must mean respect for all human life. If the Australian Government is opposed to capital punishment, it must condemn it in absolute terms, not contingently. If it opposes the death penalty for the Bali nine, it should oppose the death penalty for the Bali bombers. We must speak out against capital punishment in all forms, in all places, unconditionally. Van Nguyen broke the law; he was foolish; he hurt no one. The Government of Singapore killed him. Let his death not be pointless: it is a reminder that we must oppose state-sponsored killing in every case, everywhere. There's evidence here that as part of an ugly tradition Australia long ago abandoned its sense of fairness. For an Australian visitor to the Yad Vashem, the message could not be more stark. Inside this Jerusalem memorial to victims of the Holocaust and printed prominently on a wall is the contribution of Australia's minister for trade and customs, T. W. White, to a 1938 conference in Evian-les-Bains, France. Representatives had gathered at the insistence of President Roosevelt to consider the plight of Jewish refugees from Nazi Germany. The Evian meeting was not a success - delegates expressed sympathy but failed to act. Explaining why a growing nation would not accept more than a small quota of refugees, the minister noted that Australia had "no real racial problem", and was "not desirous of importing one by encouraging any scheme of large-scale foreign migration". Although Australia would not help, concluded the minister, "I hope that the conference will find a solution to this tragic world problem". It did not. In WATCHING BRIEF, Julian Burnside mentions the Australian contribution to Evian only in passing. By the time it appears, a third of the way into this collection of his essays and speeches, Evian only reinforces Burnside's core point: Australia's recent refugee policy continues an ugly tradition. There have been moments of enlightened policy - the Fraser government "quietly shepherded into Australia tens of thousands of Vietnamese and Cambodian boat people each year and helped them become a part of the Australian community". But for Burnside the policy of mandatory detention for "informal arrivals", introduced by Labor in 1992 and refined by the Coalition from 1996, is a crime. As he argues with admirable concision: "Let me be absolutely clear about this: Australia treats asylum-seekers abominably - we imprison them indefinitely, we torment them, we are willing to return them to torture or death. Our treatment of them constitutes a grave crime against our own laws." Burnside expresses self-doubt in the few autobiographical passages of WATCHING BRIEF. A "sense of inadequacy", he speculates, "seems closely correlated with a driving desire to achieve". Yet there is nothing tentative or shy about the judgements offered. Justice should not be compromised for electoral gain. Ministers have "lied to the Australian public consistently and on a vast scale on the issue of asylum-seekers". Australia's human rights record has been "seriously damaged". And not just governments are culpable - Burnside is sharply critical of media that shy away from "unpopular truths". The mainstream press, he argues, "is too frightened, too weak, too compliant, or too stupid" to hold government to account and so contributes to "our national disgrace". These are tough-minded words but Burnside makes his case with care. He begins with a definition of justice and the responsibilities of lawyers to see justice as a cause, not a job. He then enumerates the dubious legal basis of mandatory detention, the political exigencies of the Pacific Solution, the absent ethics of honesty in public life and the use of solitary confinement to isolate difficult cases. WATCHING BRIEF uses only occasional examples, drawing these from official records to illustrate how Australia treats those asylum-seekers who reach our shores. Burnside describes individuals held by private contractors for 23 hours a day in cramped cells, denied books, writing material or electronic entertainment. The treatment of refugees creates a neat segue into discussion of Australia's terror laws. The second section of WATCHING BRIEF explores contemporary cases involving David Hicks and Jack Thomas to make a similar point: a nation that prides itself on the "fair go" is not living its professed values. Following exploration of asylum and terrorism laws, Burnside closes with vignettes about justice with famous cases of wrongful conviction briefly described. Each is interesting but the section fits awkwardly within the structure, as though an overarching theme is required to justify the collection. In fact, the heart of Watching Brief is Burnside's indignation that Australia has abandoned its sense of fairness. The ghost of Evian hovers still, suggesting a nation that has learned - and forgotten - nothing. Only in passing does Burnside describe the personal cost of taking on a human rights brief. The journey has cost him friends and professional contacts, attracting ad hominem attacks in Parliament and on talk-back radio. As the preface notes, Burnside's motives have been questioned, his credentials attacked. Yet the response says much about Burnside's confidence in his evidence. WATCHING BRIEF is cool and rational, providing uncomfortable detail in succinct prose. Burnside wants Australians to confront what is done in their name. Detaining asylum-seekers is wrong and illegal and decent people should demand change. Burnside does not draw a parallel with Emile Zola but a brief chapter late in the book recalls the Dreyfus affair and Zola's famous letter J'Accuse. Like Zola in 1898, Burnside accuses his nation's most senior leaders of complicity in injustice, of duplicity in their public statements. He condemns attacks on human rights and the consequences for those wrongly and secretly imprisoned. It took the French army 100 years to admit Alfred Dreyfus was wrongly convicted. Burnside hopes Australians will recognise a tragic national mistake with more alacrity and make good the promise of justice. Watching Brief is his argument for a new approach to human rights policy. Julian Burnside has produced a brief that deserves a wide audience and careful judgement. Julian Burnside QC is a polymath. He reminds this reviewer of the nineteenth century amateur learned man, popping up unexpectedly in one area of learning or another, reading a paper on mathematics at the Royal Society; publishing an illustrated book on Plants of the Congo; and reforming the Royal Mint. Mr. Burnside's accomplishments include a children's book, Matilda and the Dragon; a book on the uses and abuses of the English language, Wordwatching: Fieldnotes of an Amateur Philologist; and, as editor, From Nothing to Zero: letters from refugees in Australia's detention centres. His website  which doubles as a site for Liberty Victoria, the Victorian equivalent of Queensland Council for Civil Liberties, is a simple but extraordinarily useful database of links to information on a broad range of topics but with a particular focus on the plight of asylum seekers and human rights information, generally. Mr. Burnside is a busy commercial silk whose portfolio of involvement in important human rights cases in Australia is second to none. On top of all that, he seems to be flying to all corners of Australia on at least a weekly basis delivering a powerful defence of justice, both procedural and substantive, and the rule of law and an equally powerful critique of those who display little love for those concepts. And in all of that, Mr. Burnside achieves a writing and speaking style that matches complex subjects with simplicity of language and easy accessibility. He is a master of the art that conceals art. Even knowing all of that, WATCHING BRIEF still astounds with the range of subject matter covered and the brilliant narrative which emerges from that range. WATCHING BRIEF incites the compulsion of the thriller in a text which covers autobiography and recent political and legal history against a background of the more distant human rights struggles on which the foundation stones of modern democratic practice and theory are based. And that's not all. Mr. Burnside displays one of the key attributes of storyteller and teacher, the ability to find themes across different subject matter and to use those themes to draw comparisons. Thus lessons are drawn, and the familiarity of well worn narratives are used, to enhance and emphasise political points made concerning current and recent events. Mr. Burnside also knows well the architecture of the human heart, our strange ability to fail to blanch at stories of millions being tortured and killed while chaining ourselves to the television to follow the story of a single stranded whale or a boy trapped down a well. So, the small heroes of his speeches and essays have names and personal histories. The parties in his case reports have personalities that spill out across the page. And many of his subjects tell their stories in their own powerful words even when their English fails to be perfectly framed. WATCHING BRIEF is primarily comprised of speeches and essays prepared by the author since 2001. They are edited to avoid repetition and cross-referenced to allow easy access to information appearing elsewhere in the book on a similar or related subject. As the Preface warns, the chapters, especially, those on Australia's treatment of asylum seekers, because of the time that they were written, describe circumstances that have since changed. Part 1, entitled Foundations, is by far the shortest of the four Parts of WATCHING BRIEF. It recounts a little of the author's social and intellectual origins and may surprise many who are aware of Mr. Burnside's powerful advocacy on human rights and justice issues. Among anecdotes of particular teachers, Chapter 1 reveals that Mr. Burnside is an alumnus of Melbourne Grammar School; that he was, until his senior years, an indifferent student; and that his sense of personal inadequacy had impacted upon his ability to relate easily to friends. The second chapter discusses the author's introduction and early development at the Bar. His practice developed slowly and led into the company and taxation fields. The takeover boom in the early eighties led to his practice becoming busier and to his getting to work with the top counsel of the time. The second half of the 90s saw involvement in a different run of cases including acting for the Maritime Union against Patrick Stevedores and Mr. Burnside's advocacy in support of the rule of law and against injustice was sparked by these experiences. Julian Burnside's emergence as a social commentator concerned about injustices in our society contrasts with a number of commentators who have become ideologues of the right. Many such commentators have started as ideologues of the left and have drifted across the political spectrum and taken up their present raucous positions. Mr. Burnside, on the other hand, has come from a conservative background (he voted Liberal in every election up until 1996) without significant political involvement so that, when his awakening occurred, it has been much more issue and rule of law based and free of broader ideological overtones apart from his ever present concern with justice and the rule of law. It is not surprising, considering the author's work in the area, both as an advocate in Courts and Tribunals and as a public advocate, that nine chapters and more than 100 pages would be devoted to the plight of asylum-seekers in Australia. Mr. Burnside develops social criticism of government action and inaction in these chapters. He develops his critique against a well-articulated framework of values and ideas and legal concepts, including concepts taken from international and domestic law including that of "crimes against humanity". The advocacy always retains its immediacy and its impact. One reason for this is the author's use of actual events happening to real people. "[She] does not eat her breakfast or other meals and throws her food in the bin. She was preoccupied constantly with death, saying, 'don't bury me here in the camp, bury me back in Iran with grandfather and grandmother'. [She] carried a cloth doll, the face of which she had coloured in blue pencil. When asked in the interview if she would like to draw a picture, she drew a picture of a bird in a cage with tears falling and a padlock on the door. She said she was the bird..."
I have been in this cage for 13 months ... Why should all these women and children... be in this cage? What have we done? Where should we seek justice? Who should we talk to and tell our story? Aren't we human beings? ... I don't know what my crime is ..."
The final chapter in Part 2 is dated April 2007. The author notes the release of the last two refugees caught up in the Pacific solution, who had been imprisoned for five years, first on Manus Island and then Nauru. Mohammed Faisal was granted permanent protection and Mohammed Sagar travelled to Sweden. The combination of some Labor backbone and a stand by Liberal backbencher, Petro Georgiou, and a few of his colleagues forced the Howard government to back down on a plan to expand the Pacific solution to imprison 43 West Papuan asylum-seekers. The tide appeared to have turned, as the author notes. However, he also notes that mandatory detention remains a reality and a $400 million high tech detention centre nears completion on Christmas Island with solitary confinement cells and special isolation facilities for children and infants. Kevin Andrews's gratuitous denigration of the African-Australian community in Australia in the second half of 2007 shows that the temptation for Australian governments to use defenceless people for political gain has not receded. The lessons of the last seven years and more, so persuasively documented in Part 2 of WATCHING BRIEF, have not lost any of their relevance. Part 3 of WATCHING BRIEF is entitled Human Rights in an Age of Terror. The speeches and essays contained therein analyse and criticise Australia's legislative and policy responses to terrorism, especially, in the wake of the attacks on New York and Washington of 11 September 2007. The author places this part of Australia's recent history in its historical context, a method which adds great impact to the criticisms made. The analysis commences with the Gunpowder plot of 5 November 1605, an analogous but failed act of political violence inspired by extreme religious views. The essay recounts the immediate response to the plot by torturing Guido Fawkes (the "Guy" of Cracker Night legend) by use of the rack leading to the identification of other suspects and the prosecution and execution (by hanging, drawing and quartering) of others who were innocent of the plot but happened to share the same religion as the conspirators. In contrast, the longer term aftermath of the events of 11 September 2001 seems a departure from the rule of law in countries including Australia and the United States and an increasing lack of commitment to its tenets by those who exercise power and influence. As with his other writing, it is particularity which gives force to the arguments used. The essay contrasts another historical event, the adoption of the US Constitution and its Bill of Rights reflecting the values of the Petition of Rights, 150 years earlier, to the current administration's abandonment of the Geneva Convention in its treatment of captured combatants. He contrasts the requirements of the Geneva Convention (and the alternative regime for the treatment of criminal suspects): humane treatment; no interrogation beyond name, rank, and serial number; and release at the end of hostilities to the notorious memo of Alberto Gonzales. Gonzales advised President Bush of the advantages of declaring prisoners at Guantanamo to be not amenable to the provisions of the Geneva Convention. The advantage, it was said, was flexibility. It would allow US officials who breached the terms of the Geneva Convention to avoid amenability to prosecution for War Crimes. "While we say with certainty that acts falling short of these would not constitute torture ... we believe that interrogation techniques would have to be similar to those in their extreme nature and the type of harm caused to amount to torture ..."
The essay then sets out accounts of treatment at Guantanamo taken from the affidavits of the Tipton Three, the three English nationals who were released at the insistence of the British government; who had gone to Afghanistan to provide humanitarian aid; and who have not been charged with any offence either before or after their release. While the space does not allow the inclusion of these descriptions in this review, they amply show the slippery slide that commences when lawyers encourage bureaucrats and politicians to defy the norms laid down in international law to ensure that captives are treated decently. They also amply justify the author's observation that "It is impossible to reconcile these events with the values which are basic to our democratic system". Part 3 also directs its attention to the legislation passed in Australia since 11 September 2001. This includes 2002 amendments to the ASIO legislation permitting incommunicado detention, for a week at a time of people not suspected of any wrong doing; and the 2005 amendments to the Criminal Code which permit the Australian Federal Police to apply for an order jailing a person for up to 14 days in circumstances where the person has not been charged with any offence and where persons are not permitted to know the evidence on which the order, obtained in their absence, was obtained. And this against a background where secrecy provisions carrying heavy penalties prevent publication of the fact that the person is being held for questioning. Mr. Burnside reserves his harshest criticism for the National Security Information (Criminal and Civil Proceedings) Act ("the NSI Act"). The Act obliges any person in any kind of proceeding who might, by asking a question, tendering a document or in any other way, adduce evidence relating to an expansively defined "national security" to notify other parties in the hearing and, ultimately, the Attorney-General of the relevant evidence. The Attorney-General may then certify, conclusively, that adducing the evidence would prejudice national security, leading to a secret and heavily weighted court hearing from which the party seeking to adduce the evidence may be excluded. And if the Court (which is directed to give the greatest weight to the certificate of the Attorney-General) so decides, in this secret hearing, the party is prevented from adducing the evidence, no matter how crucial it might be to the party's case whether it be the defence of a serious criminal charge or an action for damages to establish the lawfulness of treatment by a government agency or any other civil or criminal proceeding. Space prevents discussion of many other aspects of the actions of Australian legislatures, politicians and officials over the last several years. Part 3 of WATCHING BRIEF serves an excellent purpose for those of us who have watched with concern as one draconian law after another was passed and perhaps spoken up at the time and perhaps not. WATCHING BRIEF reminds us of the cumulative effects of the large number of such laws and gives us a chance to shock ourselves free of the desensitising effect of the sheer number and repetitive nature of the public relations spin to which we have been exposed. WATCHING BRIEF is a timely reminder and a call to arms to ensure that these laws do not remain on the statute books, indefinitely, simply because those of us who care about the rule of law have come to accept a new status quo as legitimate. Part 4 of WATCHING BRIEF is entitled Justice and Injustice. It contains a disparate but intensely fascinating collection of essays on famous legal cases from recent and more distant times. Each essay (and the case it discusses) provides an historical moral lesson. In some cases, such lessons go to the heart of injustice and involve similar themes to Parts 2 and 3 of WATCHING BRIEF with their respective concentration on Australia's treatment of asylum seekers and Australia and other countries' responses to post September 2001 terrorist threats. Other such lessons are more personal and homely and reflect on the tragic and heroic aspects of human nature which find their expression in times of great stress. This reviewer was familiar with some of the cases discussed and with some he was not. In either circumstance, the book's treatment of the events is spell-binding. No essay failed to provide a new perspective or an enlightening reflection. The cases discussed include the execution of Van Nguyen in Singapore for a drug related offence on 2 December 2005. This essay uses the famous address of Clarence Darrow in the case of Leopold and Loeb in Chicago in 1924 to argue the need for a consistent stand against capital punishment, a lesson still to be learned by John Howard and Kevin Rudd, as they displayed during the faux election campaign of 2007. Other cases include the prosecution of Roger Casement for treason and the questionable role played therein by famous English advocate, FE Smith (later Lord Birkenhead); the Oscar Slater case (a great example of the dangers posed by an overzealous police force and the importance in criminal investigation of keeping an open mind); and the Adolph Beck case (one of the best examples of the dangers of relying without more on identification evidence). The sheer bizarre or the interest of human drama arise from the discussion of Dr. Crippen's almost perfect crime in murdering his wife; the case of Alma Rattenbury and her much older husband and much younger lover; and the successful self-defence by Noel Pemberton-Billing on a charge of criminal libel in the "Black Book" case. In each essay, the author manages to convey the events as human drama and allows the reader to appreciate the central characters as human actors, no matter how unusual or dramatic are the events in which they play their part. The reviewer makes no apology for sharing many of the values and agreeing with much of the critique expressed in Watching Brief. The book is a very valuable collection of the important analysis and discussion for which Julian Burnside QC has been responsible over a period approaching a decade. I am a great admirer of the achievements of Julian as he has campaigned tirelessly during that period often with little support from politicians and news media who should have known and done better. The book is more than that however. It is a fascinating read. Mr. Burnside is a great communicator and his analysis and argument is not only clearly and simply presented but also accompanied by narrative that is full of interest. My recommendation is that you pursue one of the following three alternatives. Persuade someone close to you to buy Watching Brief for you. Alternatively, buy it for someone who lives in the same house as you so you can steal it and read it first. If all else fails, buy it for yourself. At recommended retail price of $32.95, you could do worse. Guy Pearse in High and Dry, Penguin Viking, 2007, notes a few of these at page 249. Christopher Pearson worked as an editor of Labor Forum. Andrew Bolt worked as a staffer for various Labor MPs. My favourite drift to the right was PP McGuiness who, when I first read him, worked on the staff of a young Bill Hayden. I am indebted to John Clarke and Brian Dawe for making this obvious connection. Another piece of historical context discussed in another essay in part 3 is the Dreyfus Affair, the scandalous series of events between 1894 and 1906 in which an exemplary Captain in the French Army's general staff was framed and then tried on secret evidence of leaking information to Germany. Dreyfus's status as a Jew and the strong anti-semitic feeling within the French military and political establishment appear to be the principal reasons why Dreyfus was not only convicted in the first instance on shaky evidence but prevented from clearing his name when the wrongfulness of the conviction had become evident to those in the higher echelons of the military. The lessons about the care required to ensure that persons are not unjustly treated because they belong to unpopular sections of society are very cogent for every Australian of Islamic background and have been highlighted by events touching this reviewer which were occurring as Watching Brief was going to print. An irony which the author does not point out is that, despite the progress made towards the rule of law, religious differences still affected rights at law and Catholics in England remained disadvantaged in 1701 as they had been in the lead up to the Gunpowder Plot. Gonzales was, later, Attorney-General from February 2005 until his forced resignation amid a series of scandals including allegations of perjury to Congress on 17 September 2007. Jay Bybee was, subsequently, appointed a Federal Court judge. He was nominated by President Bush on 22 May 2002 and confirmed by the Senate on March 13, 2003. 2. clarification that you'd like to receive WATCHING BRIEF, and the number of copies you require.